Providing a place for washout is your client’s biggest issue after the concrete is poured. 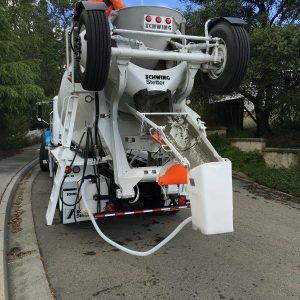 Washout Watchdog fully contains washout water on the truck, allowing you to return it to your facility for recycling. Adding a small surcharge for this service will quickly pay back the cost of the system. Tank styles are available for every truck configuration, including the fender tank, front discharge tank, underdog tank, standard tank, half-fender tank, 9-legged tank, and platform tank. Win new customers with a system that pays for itself through modest recycling fees. There is even a low-cost leasing plan for concrete producers who are not ready to make a capital expenditure. Made to work in extreme weather. Insulated units available. Units for rear discharge, front discharge and volumetric trucks. Requires NO pumps! Let gravity do all the work.